Band officially formed in 2005. Kenta Fukui (bass) joined in 2008. 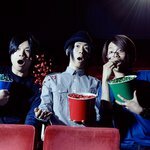 Band consists of Hirofumi Hatano (vocals, guitar), Kenta Fukui (bass), and Daigo Yamaguchi (drums).